Before the American Civil War (1861-65), every state in the Confederacy had stringent laws forbidding anyone to teach slaves reading and writing. In North Carolina, it was a crime to distribute books or pamphlets to slaves. After emancipation, and well into the mid-20th century, schools remained segregated in both the North and South either by law or local customs. The legacy of past discrimination lives on in some of America’s poorest communities. Throughout the years, sport has served as an avenue for upward social mobility for many minorities. The National Collegiate Athletic Association (NCAA) prides itself on providing athletic scholarships that have helped to democratise and to enhance the diversity of predominantly white institutions. In 2015, the Institute for Diversity and Ethics in Sport reported that 52.9% of football players in the NCAA’s most competitive subdivision were black. Only 42% were white. The breakdown for basketball players was similar. African Americans, who constitute only 13.2 per cent of the American population, are heavily over-represented in athletic programmes that generate on average about US$6.1 billion in revenue a year, thus subjecting them to tremendous pressure to make sports their top priority. A question that is being asked across the United States right now is “what kind of magic does it take for college athletes, especially those from very disadvantaged academic backgrounds, to remain academically eligible for sports?” The answer, many argue, is academic corruption. Cheating has probably always been a part of college life. What sets the most recent cases apart is that the cheating appears to have become institutionalised. In the case of the University of North Carolina, one of America’s finest universities, the school’s administration admitted that faculty, coaches, athletic advisors, and others affiliated with the institution were involved. A key player in the scandal was a professor who offered courses over the years that required no attendance and little work except for a paper that was never closely read by the professor. Virtually all students, including many athletes, received A’s or B’s. 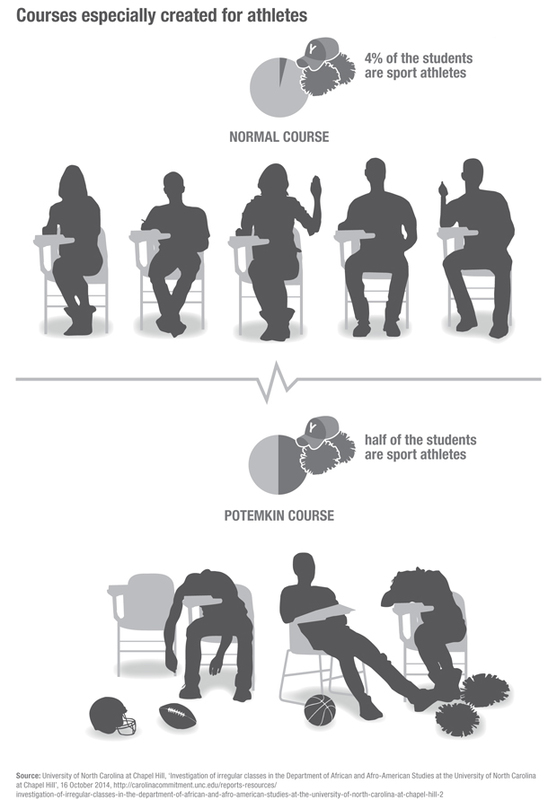 University personnel directed athletes into this class. The University of North Carolina admitted athletes, some of whom could barely read, kept them heavily involved in their sport throughout the entire year, and used them primarily to bring revenue and prestige to their athletic programme. Like the plantation owners of old, the university was more concerned with keeping white folks happy than with teaching their workers how to read. This depiction is partially hyperbole, but draws on what author Billy Hawkins eloquently describes in his book on college sport called “The New Plantation” . Cheating scandals like the one at the University of North Carolina are not limited to a few rogue universities. On the contrary, some violations of academic integrity are to be expected in any school that requires athletes with limited academic skills to give so much time and attention to sports that an army of tutors and academic support personnel is required to keep them eligible. Even athletes from strong academic backgrounds will seek out academic short cuts. The NCAA reports that it has 20 academic corruption cases currently under investigation, compared to only one last year. If the commercialisation of sport in higher education continues to grow at its current pace, the pressure to compromise academic integrity will also increase, thus having a corrosive impact on American education at every level. Academic corruption, in addition to a nascent union movement by college players, and plaintiffs lining up to sue the NCAA on antitrust grounds suggest that it is time for the Federal Government to establish a Presidential Blue Ribbon Commission to sort these important matters out. College sport in America is in crisis. Head to our Corruption in Sport Initiative for Jay Smith’s more detailed assessment of academic fraud and US college sports: Academic fraud and commercialised collegiate athletics: lessons from the North Carolina case.